قربانی, فرشید, یونسی, حبیب ا..., مهربان, زهرا, صبری چلیک, محمت, قریشی, علی اصغر, انبیا, منصور. (1395). حذف آنیون کروم شش ظرفیتی از محلول‌های آبی با استفاده از ماده نانو حفره MCM-41 عامل‌دار شده با گروه آمینی. مجله آب و فاضلاب, 27(4), 2-14. فرشید قربانی; حبیب ا... یونسی; زهرا مهربان; محمت صبری چلیک; علی اصغر قریشی; منصور انبیا. "حذف آنیون کروم شش ظرفیتی از محلول‌های آبی با استفاده از ماده نانو حفره MCM-41 عامل‌دار شده با گروه آمینی". مجله آب و فاضلاب, 27, 4, 1395, 2-14. قربانی, فرشید, یونسی, حبیب ا..., مهربان, زهرا, صبری چلیک, محمت, قریشی, علی اصغر, انبیا, منصور. (1395). 'حذف آنیون کروم شش ظرفیتی از محلول‌های آبی با استفاده از ماده نانو حفره MCM-41 عامل‌دار شده با گروه آمینی', مجله آب و فاضلاب, 27(4), pp. 2-14. قربانی, فرشید, یونسی, حبیب ا..., مهربان, زهرا, صبری چلیک, محمت, قریشی, علی اصغر, انبیا, منصور. حذف آنیون کروم شش ظرفیتی از محلول‌های آبی با استفاده از ماده نانو حفره MCM-41 عامل‌دار شده با گروه آمینی. 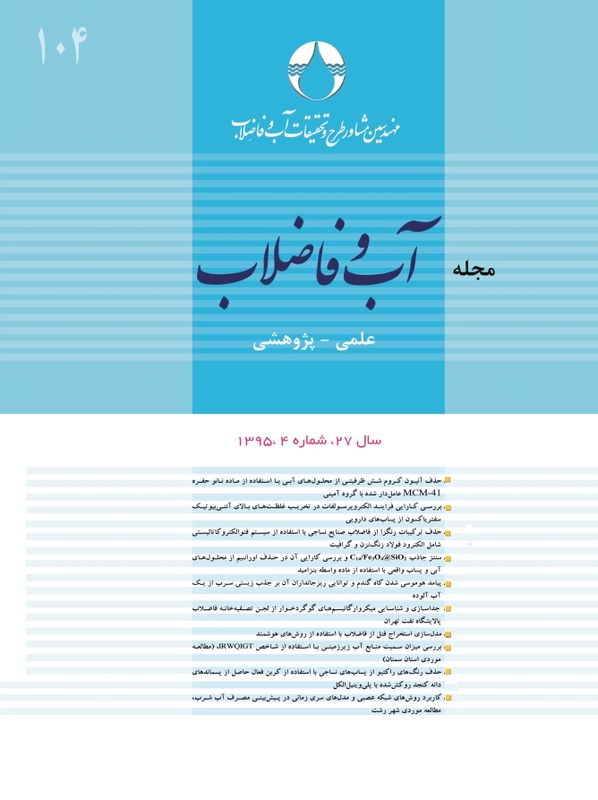 مجله آب و فاضلاب, 1395; 27(4): 2-14. در این پژوهش به‌منظور حذف کروم از محلول‌های آبی ماده نانو حفره MCM-41 آمین دار شده با استفاده از روش پیوندزنی پس سنتزی به‌وسیله گروه 3-آمینوپروپیل تری‌متوکسی‌سیلان تولید شد. آنالیزهای پراش پرتو ایکس، جذب- واجذب گاز نیتروژن، وزن‌سنجی حرارتی و طیف‌سنجی عبوری مادون قرمز فوریر (FT-IR)، تشکیل ماده میان‌حفره با ساختار منظم و عامل‌دار شدن با گروه آمین را تصدیق کرد. NH2-MCM-41 به‌عنوان جاذب برای حذف یون‌های کروم شش ظرفیتی از محلول‌های آبی استفاده شد. جذب در سیستم ناپیوسته برای ارزیابی اثر متغیرهای pH محلول، مقدار جاذب، غلظت یون‌های فلزی و دما انجام شد. نتایج به‌دست آمده نشان داد که با افزایش مقدار جاذب، درصد جذب افزایش و ظرفیت جذب کاهش یافت، به‌طوری که بیشترین میزان ظرفیت جذب 124 میلی‌گرم در گرم با مقدار جاذب 2/0 گرم در لیتر به‌دست آمد. همچنین pH برابر 3 به‌عنوان pH بهینه به‌دست آمد. بررسی تغییرات میزان جذب با افزایش غلظت یون‌های کروم نشان ‌داد که با افزایش غلظت، درصد جذب کاهش و میزان ظرفیت جذب افزایش می‌یابد. نتایج مطالعه ترمودینامیک نشان داد که فرایند جذب به شدت وابسته به دما است و ظرفیت جذب با افزایش دما افزایش یافت که بیانگر گرماگیر بودن و طبیعت خودبخودی فرایند جذب است. An amino-functionalized nanoporous material was prepared by grafting 3-aminopropyl trimethoxysilane (APTMS) group onto MCM-41. The as-synthesized material was characterized by X-ray diffraction (XRD) analysis, nitrogen adsorption-desorption measurements (BET), thermogravimetric analysis (TGA), and Fourier transform infrared spectrometry (FTIR) to confirm the ordered mesoporous structure and the functionalization of the amino group. The NH2-MCM-41 thus obtained was employed as the sorbent to remove Cr(VI) ions from aqueous solutions. The batch adsorption process was carried out to evaluate the effects of solution pH, adsorbent dosage, metal ion concentration, and temperature. Results revealed that removal efficiency increased to a maximum of 124 mg.g‒1 and metal uptake decreased (0.1 g.l‒1) with increasing sorbent dosage from 0.1 to 3.5 g.l‒1. A reverse trend was, however, observed with increasing Cr(VI) concentration. It was also found that a pH equal to 3 was the optimum level for the removal of Cr(VI) ions from aqueous solutions. Thermodynamic examinations revealed the strong dependence of the adsorption process on temperature such that adsorption capacity increased with increasing temperature, indicating the endothermic and spontaneous nature of the adsorption process. 1. Malkoc, E., Nuhoglu, Y., and Abali, Y. (2006). “Cr (VI) adsorption by waste acorn of Quercus ithaburensis in fixed beds: Prediction of breakthrough curves.” Chemical Engineering Journal, 119(1), 61-68. 2. Baral, S.S., Das, N., Ramulu, T.S., Sahoo, S.K., and Das, S.N. (2008). “Removal of Cr(VI) by thermally activated weed Salvinia cucullata in a fixed-bed column.” Journal of Hazardous Materials, 161, 1427-1435. 3. Dakiky, M., Khamis, M., Manassra, A., and Mer’eb, M. (2002). “Selective adsorption of Cr(VI) in industrial wastewater using low-cost abundantly available adsorbents.” Adv. Environ Res., 6, 533-540. 4. Padma, V., Padmavathy, V., and Dhingra, S. C. (2003). “Kinetics of biosorption of cadmium on bakers yeast.” Bioresour. Technol., 89, 281-287. 5. Martínez, M., Miralles, N., Hidalgo, S., Fiol, N., Villaescusa, I., and Poch, J. (2006) “Removal of lead(II) and cadmium(II) from aqueous solutions using grape stalk waste.” Journal of Hazardous Materials, 133(1-3), 203-211. 6. Mohan, D., and Pittman, Jr CU. (2006). “Activated carbons and low cost adsorbents for remediation of tri- and hexavalent chromium from water.” Journal of Hazardous Materials, 137(2), 762-811. 7. Krishna, B.S., Murty, D.S.R., and Jai Prakash, B.S. (2001). “Surfactant-modified clay as adsorbent for chromate.” Applied Clay Science, 20 (1-2), 65-71. 8. Bayramoğlu, G., and Arıca, M.Y. (2005). “Ethylenediamine grafted poly (glycidylmethacrylate-co-methylmethacrylate) adsorbent for removal of chromate anions.” Separation and Purification Technology, 45(3), 192-199. 9. Lam, K.F., Yeung, K.L., and McKay, G. (2007). “Selective mesoporous adsorbents for Cr2O72- and Cu2+ separation.” Microporous and Mesoporous Materials, 100(1-3), 191-201. 10. Dai, Z.J., and JU, H. (2012). “Bioanalysis based on nanoporous materials.” TrAC Trends in Analytical Chemistry, 39, 149-162. 11. Hartmann, M., and Vinu, A. (2003). “Comparison of the mechanical stability of cubic and hexagonal meso- porous molecular sieves with different pore sizes.” Studies in Surface Science and Catalysis, 146, 285-288. 12. Soler-lllia, G.J.d.A.A., Sanchez, C., Lebeau, B., and Patarin, J. (2002). “Chemical strategies to design textured materials: From microporous and mesoporous oxides to nanonetworks and hierarchical structures.” Chemical Reviews, 102(11), 4093-4138. 13. Brady, R., Woonton, B., Gee, M.L., and O'Connor, A.J. (2008). “Hierarchical mesoporous silica materials for separation of functional food ingredients - A review.” Innovative Food Science and Emerging Technologies, 9(2), 243-248. 14. Kresge, C.T., Leonowicz, M.E., Roth, W.J., Vartuli, J.C., and Beck, J.S. (1992). “Ordered mesoporous molecular sieves synthesized by a liquid-crystal template mechanism.” Nature, 359 (6397), 710-712. 15. Bhagiyalakshmi, M., Yun, L.J., Anuradha, R., and Jang, H.T. (2010). “Utilization of rice husk ash as silica source for the synthesis of mesoporous silicas and their application to CO2 adsorption through TREN/TEPA grafting.” Journal of Hazardous Materials, 175 (1-3), 928-938. 16. Ho, K.Y., McKay, G., and Yeung, K.L. (2003). “Selective adsorbents from ordered mesoporous silica.” Langmuir, 19(7), 3019-3024. 17. Li, J., Miao, X., Hao, Y., Zhao, J., Sun, X., and Wang, L. (2008). “Synthesis, amino-functionalization of mesoporous silica and its adsorption of Cr(VI).” Journal of Colloid and Interface Science, 318(2), 309-314. 18. Zhao, D., Peidong, Y., Qisheng, H., Bradley, F. C., and Galen D.S. (1998). “Topological construction of mesoporous materials.” Current Opinion in Solid State and Materials Science, 3(1), 111-121. 19. Ghorbani, F., Younesi, H., Ghasempouri, S.M., Zinatizadeh, A.A., Amini, M., and Daneshi, A. (2008). “Application of response surface methodology for optimization of cadmium biosorption in an aqueous solution by Saccharomyces cerevisiae.” Chemical Engineering Journal, 145(2), 267-275. 20. Chen, C., and Wang, X. (2006). “Adsorption of Ni(II) from aqueous solution using oxidized multiwall carbon nanotubes.” Industrial and Engineering Chemistry Research, 45(26), 9144-9199. 21. Wang, X., Chen, C., Hu, W., Ding, A., Xu, D., and Zhou, X. (2005). “Sorption of 243Am(III) to multiwall carbon nanotubes.” Environmental Science and Technology, 39(8), 2856-2860. 22. Yang, X., and Al-Duri, B. (2005). “Kinetic modeling of liquid-phase adsorption of reactive dyes on activated carbon.” Journal of Colloid and Interface Science, 287(1), 25-34. 23. Aguado, J., Arsuaga, J.M., Arencibia, A., Lindo, M., and Gascón, V. (2009). “Aqueous heavy metals removal by adsorption on amine-functionalized mesoporous silica.” Journal of Hazardous Materials, 163(1), 213-221. 24.Wan, Y., and Yuan, D. (2007). “On the controllable soft-templating approach to mesoporous silicates.” Chemical Reviews, 107(7), 2821-2860. 25. Benhamou, A., Baudu, M., Derriche, Z., and Basly, J.P. (2009). “Aqueous heavy metals removal on amine-functionalized Si-MCM-41 and Si-MCM-48.” Journal of Hazardous Materials, 171(1-3), 1001-1008. 27. Yokoi, T., Yoshitake, H., and Tatsumi, T. (2004). “Synthesis of amino-functionalized MCM-41 via direct co-condensation and post-synthesis grafting methods using mono-, di- and tri-amino-organoalkoxysilanes.” Journal of Materials Chemistry, 14(6), 951-957. 28. Hui, K.S., and Chao, C.Y.H. (2006). “Synthesis of MCM-41 from coal fly ash by a green approach: Influence of synthesis pH.” Journal of Hazardous Materials, 137(2), 1135-1148. 29. Zhao, X.S., Lu, G.Q., and Millar, G.J. (1996). “Advances in mesoporous molecular sieve MCM-41.” Industrial and Engineering Chemistry Research, 35(7), 2075-2090. 30. Da’na, E., and Sayari, A. (2011). “Adsorption of copper on amine-functionalized SBA-15 prepared by co-condensation: Equilibrium properties.” Chemical Engineering Journal, 166(1), 445-453. 31. Shahbazi, A., Younesi, H., and Badiei, A. (2012). “Batch and fixed-bed column adsorption of Cu(II), Pb(II) and Cd(II) from aqueous solution onto functionalised SBA-15 mesoporous silica.” The Canadian Journal of Chemical Engineering, 91(4), 739-750. 32. Alothman, Z.A., Apblett, A.W. (2010). “Metal ion adsorption using polyamine-functionalized mesoporous materials prepared from bromopropyl-functionalized mesoporous silica.” Journal of Hazardous Materials, 182(1-3), 581-590. 33. Li, W., Zhang, L., Peng, J., Li, N., Zhang, S., and Guo, S. (2008). “Tobacco stems as a low cost adsorbent for the removal of Pb(II) from wastewater: Equilibrium and kinetic studies.” Industrial Crops and Products, 28(3), 294-302. 34. Shahbazi, A., Younesi, H., and Badiei, A. (2011). “Functionalized SBA-15 mesoporous silica by melamine-based dendrimer amines for adsorptive characteristics of Pb(II), Cu(II) and Cd(II) heavy metal ions in batch and fixed bed column.” Chemical Engineering Journal, 168(2), 505-518. 35. An, D., Guo, Y., Zhu, Y., and Wang, Z. (2010). “A green route to preparation of silica powders with rice husk ash and waste gas.” Chemical Engineering Journal, 162(2), 509-514. 36. Kalapathy, U., Proctor, A., and Shultz, J. (2000). “A simple method for production of pure silica from rice hull ash.” Bioresource Technology, 73(3), 257-562. 37. Zhao, H., Hu, J., Wang, J., Zhou, L., and Liu, H. (2007). “CO2 capture by the amine-modified mesoporous materials.” Acta Physico-Chimica Sinica, 23(6), 801-806. 38. Heidari, A., Younesi, H., and Mehraban Z. (2009). “Removal of Ni(II), Cd(II), and Pb(II) from a ternary aqueous solution by amino functionalized mesoporous and nano mesoporous silica.” Chemical Engineering Journal, 153(1-3), 70-79. 39. Mercuri, L.P., Matos, J.R., Li, Z., and Jaroniec, M. (2006). “Comparative thermogravimetric and adsorption study of highly ordered mesoporous materials.” Journal of Colloid and Interface Science, 296(1), 377-380. 40. Yoshitake, H., Yokoi, T., and Tatsumi, T. (2002). “Adsorption of chromate and arsenate by amino-functionalized MCM-41 and SBA-1.” Chemistry of Materials, 14(11), 4603-4610. 41. Anwar, J., Shafique, U., Waheed, U. Z., Salman, M., Dar, A., and Anwar, S. (2010). “Removal of Pb(II) and Cd(II) from water by adsorption on peels of banana.” Bioresource Technology, 101(6), 1752-1755. 42. Ghiaci, M., Kia, R., Abbaspur, A., and Seyedeyn-Azad, F. (2004). “Adsorption of chromate by surfactant-modified zeolites and MCM-41 molecular sieve.” Separation and Purification Technology, 40(3), 285-295. 43. Jiang, M-Q., Jin, X-Y., Lu, X-Q., and Chen, Z-L. (2010). “Adsorption of Pb(II), Cd(II), Ni(II) and Cu(II) onto natural kaolinite clay.” Desalination, 252(1-3), 33-39. 44. Adamczyk, Z., and Warszynski, P. (1996). “Role of electrostatic interactions in particle adsorption.” Advances in Colloid and Interface Science, 63, 141-149. 45. Liu, Y., and Xu, H. (2007). “Equilibrium, thermodynamics and mechanisms of Ni2+ biosorption by aerobic granules.” Biochemical Engineering Journal, 35(2), 174-182. 46. Chen, H., Zhao, J., Dai, G., Wu, J., and Yan, H. (2010). “Adsorption characteristics of Pb(II) from aqueous solution onto a natural biosorbent, fallen Cinnamomum camphora leaves.” Desalination, 262(1-3), 174-182. 47. Xin, X., Wei, Q., Yang, J., Yan, L., Feng, R., Chen, G., DU, B., and Li, H. (2012). “Highly efficient removal of heavy metal ions by amine-functionalized mesoporous Fe3O4 nanoparticles.” Chemical Engineering Journal, 184,132-140.